I've had that happen to me which is why I don't park near a wall anymore because some douche always squeezes between my car and the wall and I'm the one stuck crawling over the passenger seat since they leave themselves enough room on their side. 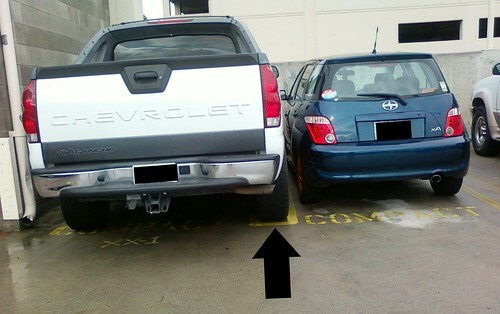 And in my case I'm not even sure where they are parking is even technically a space. Key the car! No, just kidding. But leave them a nasty note! I thought about leaving a nasty note, but didn't really have time. I did email these photos to the Parking Office, with license plate visible, but I'm pretty sure nothing will happen. Wow. 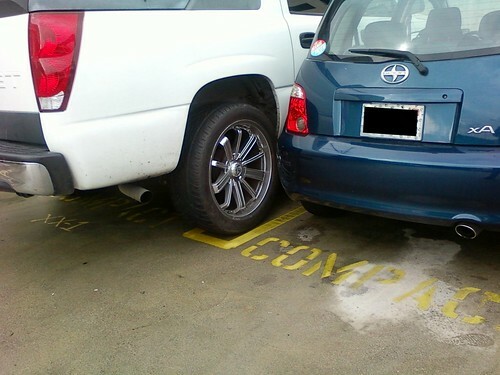 That wins this month's parking tard award. I guess there was enough room to exit the truck's left side, but from the angle of your pix it might have been easier for the idiot to pop out through a sunroof, if available.